Today, May 18th, 2018, is a pretty monumental day for botanical art community in the world. The American Society of Botanical Artists planned and initiated a great event happening on the same day in 25 countries in 6 continents. All exhibits are showcasing native plants in the countries, and 40 painting images of each exhibit will be streamed online. So, 1,000 botanical art images will be broadcasted today! Today we will see many posts online regarding to this wonderful event. This really boosts interests in botanical art, plants, and nature conservation in a beautiful way. 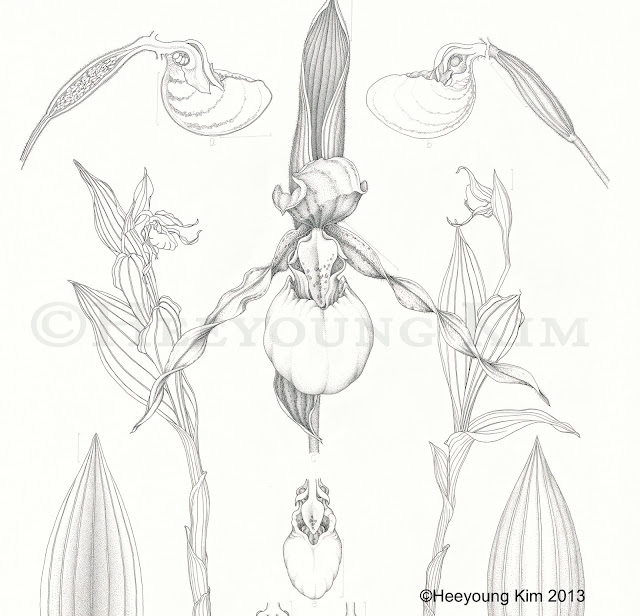 A few years ago I studied White Lady's Slipper Orchid, listed as endangered, threatened or rare in many states. With the help from ecologist and botanist, I could study it closely and drew this scientific plate with ink. The image shown here is part of the whole image. It is small and very cute plant, well, you can assume almost all flowers look cute to me :). I painted another large watercolor of this plant, too. Joel Oppenheimer Edition and original are available for both ink and watercolor. For more information about this event, go to ASBA website, artist's behind story will be added later. I think. Many thanks to all who have worked so hard to make this monumental event happen!